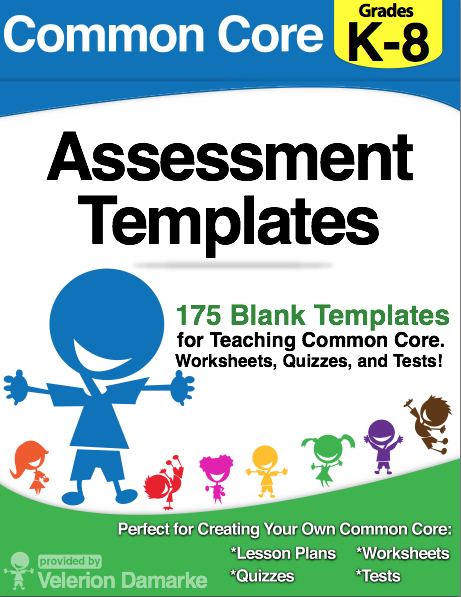 Have Fun Teaching and Core Common Standard’s very own Velerion Damarke (the pen name of Andrew Frinkle), with some artistic help from HFT’s prez Mark Luchauer, has created a brand new common core assessment tool called Common Core Assessment Templates. We thought that this was a great companion tool that could be used in certain situations with our own Common Core Workbooks and Common Core Assessment Workbooks. Before we start getting into the details on the new program, here’s the difference between this program and our own program: The Common Core Assessments have been developed specific to each grade level and each standard, while this workbook of blank testing templates is for any grade. So, while Core Common Standards’ program offers an assessment for each standard that you can grade, this one is more of a make-your-own assessment guidebook with TONS of blank templates to help you design tests of your own. The brand new Common Core Assessment Templates are here! This handsome volume is 196 pages long, and can be bought via a digital download on TeachersPayTeachers.com or bought in a B&W version for $14.99 on Amazon and a full color version for $36.99 (color costs more to print). Fourth Grade Common Core Assessments is out!. This rocking new volume of assessments is an amazing addition to any classroom. You can use it to supplement your lessons. You can fill out the progress reports for RTI meetings, for staffing meetings, or for parent conferences. It goes great with our other workbook series, or works all by itself. You get to decide how YOU use this wonderful tool in your classroom. It’s short and to the point, with an assessment or two in every standard in fourth grade. Get your 100-or-so page volume now! Have you heard the news? Core Common Standards has released a new set of workbooks to go along with the Common Core Standards Workbook series released last year. These ones don’t focus on activities and worksheets, though. These ones are all about giving you the tools you need to assess student success in each standard. Each 100+ page volume contains at least one assessment for all standards in third grade. 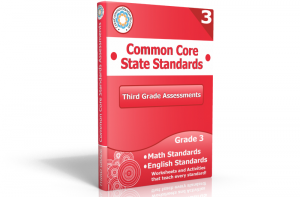 Check out your copy of Third Grade Common Core Assessments today! They are available on USB or pdf via download.